The Scott Administration has been plagued by pay-to-play accusations and cronyism, including awarding lucrative state contracts to his political supporters, and pushing for legislation and policies that benefit his and his donors’ financial interests. Here are some of his greatest hits! Citizens Insurance Policy Transfers: A company that contributed $110,000 to Rick Scott’s re-election effort received a controversial $52 million “sweetheart” deal with Citizens Insurance, Florida’s state-run insurance company. Policyholders may wind up with less reliable coverage and higher rates after three years than they would have if they stayed with Citizens. Read more..
10. Was Against Tax-funded Rowing Center. What Changed? 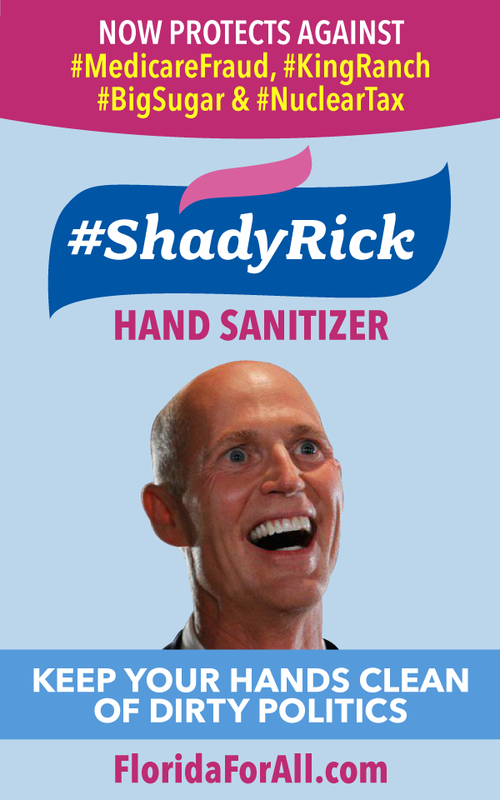 Don't forget to download and print out a #ShadyRick hand sanitizer to "Keep Your Hands Clean of Dirty Politics". Fits most 8 oz. bottles. (Orlando, FL) – Senator Darren Soto, Senator Geraldine Thompson, and Carlos Smith, Chair of the Orange County DEC, joined local voting rights advocates today to denounce the Scott Administration’s voter suppression tactics and let the Governor know that efforts to prevent Floridians from voting will not be tolerated. The speakers echoed Attorney General Eric Holder’s stern warning that the agency will be ‘carefully monitoring’ voter access in the state because Florida has ‘repeatedly added barriers to voting and redistricted access to the polls’. “Since the founding of our country, voting has been a dear and fundamental American right, but one that was denied, either in law or in practice, to too many Americans for too long,” said Senator Geraldine Thompson. Unfortunately, Rick Scott’s record on voting has been one of obstacle and delay. All voters ought to be outraged by these attacks on one of our most basic rights." The speakers spoke out against many of these politically motivated tactics, including a 2011 law that cut early voting days in half, which created long lines and delays of up to six hours or more for voters to cast their ballots. According the Orlando Sentinel, the law, since changed, kept more than 200,000 Floridians from voting. The following year, the Scott Administration announced a voter roll purge of supposed non-citizens. In the end, the purge turned out to be wildly inaccurate, cost taxpayers tens of thousands of dollars, and unfairly targeted Latinos and African-Americans. Over 80 percent of those on the first purge lists were people of color and more than 6 in 10 were Hispanic. Protestors warned that Scott and his administration have and will continue efforts to create barriers to voting, including an aborted attempt at a second voter purge, a directive from Secretary of State Ken Detzner, limiting drop off locations for absentee ballots, as well as the refusal to allow early voting at University of Florida. Carlos Smith, Chair of the Orange County DEC, and local environmentalists held a press conference on Friday, July 25th, denouncing Governor Rick Scott’s financial ties to the Sabal Trail pipeline, which will carry volatile fracked gas near cities and ecologically sensitive areas. Last month it was reported that Scott had a $135,000 stake in Schlumberger Ltd, a firm with ties to illegal fracking operations near the Everglades and fresh water aquifers in Collier County. The controversial pipeline will cut through 13 counties in Florida and run above the Floridan Aquifer, one of the state’s major sources of drinking water. It will carry methane gas from fracking operations, which is highly volatile and explosive. The speakers warned of Spectra’s dismal safety record, including a $15 million fine for discharging highly toxic PCBs at 89 sites along another gas pipeline running from Texas to New Jersey. Since 2006, Spectra has been responsible for almost $9 million in property damage. Environmentalists called on Scott to instead harness Florida’s rich renewable energy sources, like solar, and take advantage of the clean energy boom, which is far outpacing the fossil fuel industry in job creation. But, with the influence that the utility companies have on the Scott administration and his allies in the legislature, it is unlikely we will see any energy reforms soon. Case in point, at this week’s Florida Public Service Commission hearings on energy efficiency, utility monopolies argued for less efficiency programs and more power plants, while successfully blocking solar power proponents from participating. All five members of the PSC were appointed by Scott, who, who has received at least $1 million in campaign contributions from both FPL and Progress/Duke Energy. Representatives Ricardo Rangel and Victor Torres joined Orange County DEC, Carlos Smith and community activists at the Osceola Courthouse today. After an increase in publicity tours aimed at Latinos in central Florida by Rick Scott, local leaders responded emphatically. The message to the governor was three months of political pandering and ads with Scott speaking broken Spanish could not erase three years of anti-Latino policy. Leaders blasted Scott for his encouragement of Arizona-style immigration laws, vetoes of bills designed to help Dreamers get driver’s licenses, and cuts to the Bright Futures Scholarship, which disproportionately affect minorities.